Denim is one of the most important pieces in your wardrobe, but you can't get plus size tall jeans just anywhere. Tall women who need large sizes with long inseams are out of luck at the retail stores, but go online and you'll find a huge selection. Just take a look at some of my favorite jean styles or shop at the plus size denim stores I list out below for even more choices. Boot-cut, flared, wide-leg, and skinny are some of the trendy fashions you'll come across on your search for women's tall plus size jeans. All with long inseams and in sizes meant to flatter a plus size figure. So, go ahead and find yourself a favorite pair to love! Alloy Apparel ($) Offers plus size tall jeans and pants in 35" and 37" inseams in up to juniors size 25. They also have a select few denim styles in extra long length 39" inseams. 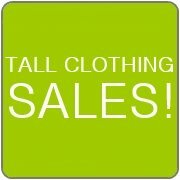 See their Tall Shop section for all extended length clothing. Avenue ($) Specializes in plus size clothing with plus size tall jeans and pants in up to 35" inseams and size 32. Select Tall Pants or Tall Jeans under the Special Sizes menu. Lane Bryant ($$) Well-known store offering plus size tall jeans and pants in up to 35.5" inseams and up to size 28. Select the Tall option in the Jeans and Pants categories. Receive free shipping and returns to any local Lane Bryant store location. Old Navy ($) Offers trendy plus size tall jeans and pants in 34" and 36" inseams and up to size 20. They also sell tops, dresses, skirts, shorts, jackets, and activewear in tall sizes at inexpensive prices. You can find a small selection of long inseams at their stores, but the most variety of lengths and sizes will be on their site. Eddie Bauer ($$) Offers a nice collection of casual and outdoor denim styles in 36" inseams, up to size 20. Most of their entire women's collection are available in tall and extended sizes. Jessica London ($$) Plus size clothing retailer with a small collection of 35" inseam denim up to size 32. Select the Women's Talls category in the Jeans section. Chico's ($$) Find plus size tall jeans in up to 35" inseams with sizes up to 20. Select Tall under the Inseam menu. CJ Banks ($) Specializes in plus size clothes, including a selection of jeans and pants in up to size 24W and 35" inseams. Shop by size in the Sizes & Lengths section. Long Tall Sally ($$) Tall women specialty store with a huge variety of jeans and pants in inseams ranging from 34" all the way to 38" and in up to size 20. They also offer a range of tall clothing in extended sizes including tops, dresses, suits, coats, activewear, and more. Shop through their website or at any of their U.S., U.K., or Canada retail locations. Torrid ($$) Find plus size tall jeans and pants in up to 36" inseams and up to size 30. Boot-cut, flared, and skinny denim styles. Select your length in the Denim and Pants categories. Woman Within ($) Specializes in plus size clothing with jeans in up to 35" inseams and sizes up to 38. See the Tall category in the Bottoms section. Roaman's ($) Specializes in plus size clothing jeans and pants in up to 36" inseams and size 32. Also sells suits and tops in long lengths. Metrostyle ($) Stylish tall jeans and pants in up to 35" inseams and size 20. Select the Tall option under the Special Sizes section. New York & Company ($$) Contemporary apparel including long length ladies jeans and pants in up to 35.5" inseams and clothing size 20. See their Tall category for the entire collection. J. Jill ($$) Carries sophisticated styles of tall jeans and pants in up to 35.5" inseams and sizes up to 20. Also has tops, sweaters, dresses, skirts, and jackets in tall sizes. JCPenney ($) Classic-style clothing including jeans and pants in up to 37.5" inseams. Select the Talls option under Women's apparel to view collection. Talbots ($$) Carries a nice collection of long jeans and pants in up to 35" inseams and size 20. Select Long/Tall Lengths option in the Denim or Pants category in Apparel. American Eagle ($) Casual denim and pants in long (34.5" to 35" inseam) and extra-long (36" inseam) with up to size 20. Simply Tall ($$) Tall specialty shop offering ladies plus size tall jeans and pants in 37" inseams and up to size 22. Also offers tops, jackets, activewear, and businesswear in long proportions. L.L.Bean ($) Casual jeans and pants in 34" inseams and up to size 20. You'll find boot-cut, slim, and relaxed styles. Land's End ($) Tall jeans and pants in 34" and 36" inseams and up to size 18. Also offers tall ladies sizes in tops and swimwear. Chadwick's ($) Women's jeans and pants in 34" and 35" inseams and in up to size 18. Select the Tall category to view all tall clothing. Gap ($$) Find a variety of trendy long size jeans and pants in up to 37" inseams, up to size 16. Also offers tops, dresses, skirts, and coats in tall sizes. Shop online or find a few longer lengths at their retail locations. The best way to get the most perfect fit for your body is to customize your own pair of plus size tall jeans. By picking out a flattering style and then giving your measurements, you're ensured a pair that will fit exactly how you want them to. How's that for an easy solution to the tall women's plus size dilemma? One custom shop to try out is Eshakti. For under $100, you can get a pair of jeans that's made just for you. They have a number of different denim styles and design options to choose from to get your pair just how you want them.